What you do need to know is right there in front of you. It’s in the subtly shifting relationship of the subjects with the camera pointed straight at them: They spend so much time pretending it’s not there that you may begin to wonder if the camera is hidden, until the briefest of glances reveals that they’re extremely conscious of it, changing your relationship with these people forever. (Is that the hint of a smile on the Solemn Woman’s face after she makes eye contact with the lens?) It’s also there in the dramatic way that the verdant, wild, and mountainous landscape outside — the cable car is a kilometer above sea level — spreads and rolls outside the windows, creating a vertigo-inducing tension between the minute features on human faces and the awesome chasms of nature. And it’s there in the sound — the creaking and clicking and occasional roaring of the cable car as it makes its way along what must have once been the most treacherous of paths. In a just world, this film would be playing in a loop at the Ziegfeld or on some museum’s IMAX screen, where you could better experience that churning sound and vanish into those landscapes and those faces. As a theatrical experience, Manakamana is spellbinding. But it’s a complex spell — one in which you could easily drift off, or find yourself distracted by some detail onscreen, or pursue a stray thought. You also begin to notice things, to tease out little moments of poignancy or tension in the film. (When the headbangers made an offhand joke about sacrificing their cat, I breathed a sigh of relief; I was worried that they had been planning to do exactly that.) These amazing long takes — which shift wildly even as they stay fixed — create a space in which your mind can both wander and be transfixed. Manakamana was produced by Harvard’s Sensory Ethnography Lab, which is overseen by Lucien Castaing-Taylor, who co-directed two of the lab’s best-known films, the sheep-herding documentary Sweetgrass and the fish’s-eye view masterpiece Leviathan. There are grant proposals to be written and academic boards to be kept happy in this world, so a lot of heady thought goes on behind these films; the Lab describes itself as “us[ing] analog and digital media to explore the aesthetics and ontology of the natural and unnatural world” and tells us that most works produced under their auspices “take as their subject the bodily praxis and affective fabric of human and animal existence.” I think that’s just a fancy way of saying that the closer you can get to depicting the physical reality of something, the deeper an understanding of it you can come to. Is that really the case, though? While I’m sure that the sound and image in this film haven’t been artificially enhanced, I’m also pretty certain that the very act of capturing such things on film changes their essence. The camera lens alters things by its very nature, both physically and philosophically; think of those people averting their gazes. 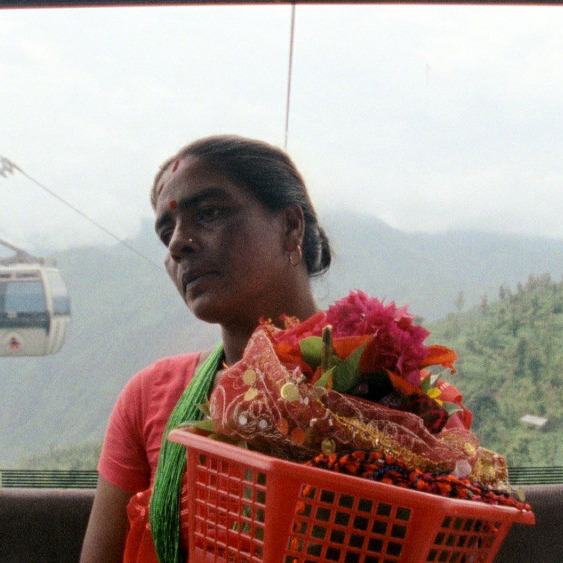 Watching Manakamana is a transcendental experience, to be sure — almost a spiritual one — but I don’t know that it gives you a better understanding of these people or their world. Instead, it creates, through the aesthetic uniqueness of its vision and through the transformative power of cinema, a shared experience that did not exist before, in real life or on film. Indeed, what’s majestic about Manakamana is that by making you focus on what’s onscreen it forces you deeper within yourself. It’s the closest I’ve seen a film come to an act of genuine hypnosis.